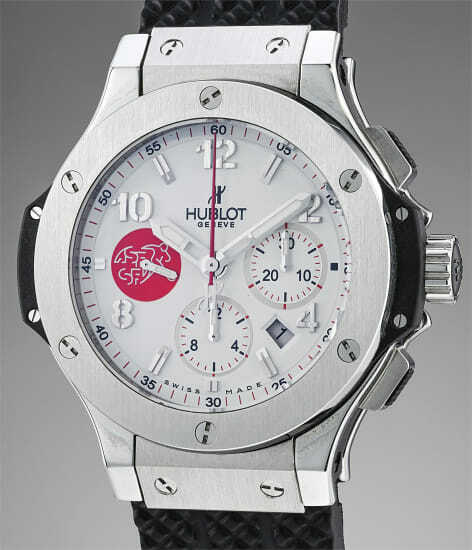 In 2007, Hublot made a limited edition of 300 pieces specially for the high ranked managers of the ASF : "Association Suisse de Football" (Swiss Football Association). The Big Bang “ASF” is the fusion between ceramic, stainless steel, Kevlar and rubber. The dial has been customized to proudly display the red ASF logo as the third subdial. The caseback is also fitted with the large red logo and the side of the case is further adorned by the Swiss cross beautifully contrasting against the polished stainless steel and black ceramic. Powered by an automatic winding movement, this chronograph also displays the date via an aperture between 4 and 5 o’clock. Masculine, bold and technical, this brand’s icon will appeal to both football fans and lovers of high end watchmaking. Hublot was founded by Carlo Crocco in 1980 and named after the French word for "porthole," which resembles their iconic bezel design. Hublot's first watch followed three years of research and was the first wristwatch to be fitted with a natural rubber strap. The brand's most recognizable watch today is the 'Big Bang', which was first launched in 2005 upon the arrival of CEO and shareholder Jean-Claude Biver. Other noteworthy models are the 'Classic Fusion' and 'King Power'.